After Louisiana, we headed north to Mississippi. Now, the accent in Texas is fairly easy to understand. The accent in Louisiana is completely different (almost French) but still easy to understand. Just go a few minutes north of there, though, and you would swear you were on another planet. The accent in Mississippi….well, let’s just say that we spent a lot of time asking them to repeat themselves. And they had trouble understanding us! You could tell by the way they would stare at our mouths, trying to make out the words. We arrived in Vicksburg and fell in love with that city all over again. There is so much to see and do in that area: the murals, the antebellum homes (complete with cannonballs), the incredible civil war memorial park, the crawfish boil, the Mississippi Fever sauce, the tornado warnings. But the thing that stood out the most was just how friendly the people are. It has to be the friendliest town in North America. At first, you’re a bit nervous – like in those movies when all the friendly people turn out to be a cult that is trying to lure you into demonic sacrifices – but after awhile you just go with the flow and really start to enjoy it. Lulu Lugnuts and I were sitting at a café, just taking a breather, when a rough-looking guy pulled up in a massive pick up truck. He rolled down his window and wished us a nice day! Not two minutes later, another guy came jogging around the corner, slowed down as he went by and also wished us a pleasant afternoon. Then there were the people at the casino who took time out of their evening to come over and give us a crash course in decapitating crawfish. 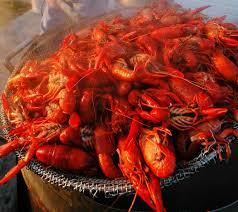 The crawfish boil was great but a little too much work for minimal return, in my humble opinion. And the friendliness lasted throughout our stay: my two sisters, JJ (don’t let her near anything covered in icing sugar) and Deadeye (don’t let her near a gun), told me they were pulling out of the RV park and two teenage girls stopped on the sidewalk to wave to them. We were awed by the civil war memorial park and spent an entire day there, looking at all the monuments. We were then treated to a fantastic crawfish boil at a local casino. You pile a huge metal pan full of the mudbugs, tear their heads off and eat the tails. It’s messy and you only get one biteful of food at a time but it’s great fun. Last but not least we tried our first (and probably last) mint juleps while sitting under a Lalique chandelier in an antebellum mansion. Not all was sunshine and and mint juleps in Vicksburg, though. We got a tornado warning….several of them in fact. To the point where we wanted to hide our phones because they wouldn’t stop bleating out warnings. What to do? What to do? It was pitch dark out, raining heavily, there was well over 6 inches of water on the ground with whitecaps on the waves and almost everyone in the park was heading to the office for shelter. So we did the only thing possible. That’s right…. We ordered pizza. And true to the friendliness of the people of Vicksburg, the pizza delivery guy said “you know there’s a tornado warning, right?”. Uh huh. But our thinking was that a) we weren’t going to abandon the cat and she sure as heck was not going to be happy getting all wet, b) we were all together so if we died, well at least we were all together, c) little boys who lie grow up to be weathermen so you can’t trust their predictions, d) there wasn’t enough pizza for everyone in the shelter and e) it was really good pizza. So we rode out the storm which touched down about a mile from us and caused some damage. After drying out, we headed for Memphis on our way home. But we’ll be back!